New and Used X-Ray Fluorescence Spectrophotometers For Sale. Products: Used THERMO SCIENTIFIC NITON XL3t 500 AND XLt 898 units available. Quantitative Metal Determination via X-Ray Spectroscopy. 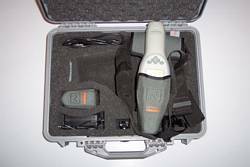 Why buy an XRF from Metallurgical Solutions? Previously owned Thermo Scientific Niton XLi/p 502 Industrial (Mining) Analyzer available, has Cd-109 source. The unit comes with a complete Niton accessories kit and sample prep material. Previously owned Thermo Scientific Niton XL3T 500 Mining and Mineral Analyzer available, configured with pin silicon high resolution detector and a 50 Kilo volt X Ray transmitter tube. The unit is a little over 1 year old, it comes with a complete Niton accessories kit and sample prep material. We can ship XRF units around the world including Europe, the Middle East, and South America. Wherever you are, we'll get it to you, FAST! Send an e-mail now to let us know what your XRF application is. We will respond quickly and with un-biased advice. We focus on building and maintaining relationships, not selling equipment. This Page and all Contents Copyright 1998 - 2015 Martin MacDonald All writings, illustrations, and site descriptions on this page are the copyrighted intellectual property of Martin MacDonald. This page (and entire site), in part or in whole, may not be reproduced by any means and displayed or used on any other web site(s).